When a horse becomes jumpy, it is usually because they are afraid, which makes them unable to effectively gauge the situation around them. If a horse gets spooked, it could be dangerous for the rider. If you’ve got a frequently skittish horse, check out these tips to calm down your nervous horse. Without a relationship between horse and handler, there can be no trust. A horse will need to become comfortable with his rider before you can address any jumpiness. You both need to feel safe around the other. By slowly allowing your companion to adjust to you, you can form a more trusting bond. Eventually, your horse will become more comfortable with your touch and allow you in his or her personal space, leading to a stronger bond. For more tips on how to create a bond with your horse, read our blog post here. Horses, like people, all have their own personalities. Once you bond with your horse, you will be able to tell what is normal for them and what is not and notice signs of agitation. Nonverbal body language is just as important as body language, says Equus Magazine. Use positive reinforcement to recognize your horse when he or she makes gains in their confidence with you. Positive reinforcement does not have to mean food exclusively, either. A reward could also mean verbal praise or scratching your horse. You do not want your horse to become food dependent – use food rewards in moderation. Plus, scratching a horse’s withers is a proven way to help calm horses that are nervous, according to Savvy Horsewoman. When riding a horse, it is important to allow them to explore their environment. By using a more loose grip on the reins, your horse has the ability to turn its head, they can see everything around them or put their head down. This gives your horse the ability to see their surroundings better and, in turn, anything that may potentially spook them. Encountering something unknown can be alarming. It doesn’t matter whether you are a horse or a human, the unknown can awaken our inner survival instincts. If your horse is spooked, try to encourage it to investigate what has caused the nervousness. If the item or action that spooks the horse is not a threat, dismount and calm your horse. Move up to the object that causes your horse to become uneasy. If you are unable to do so, place yourself between the object and the horse. This will encourage your companion to thoroughly assess the situation. 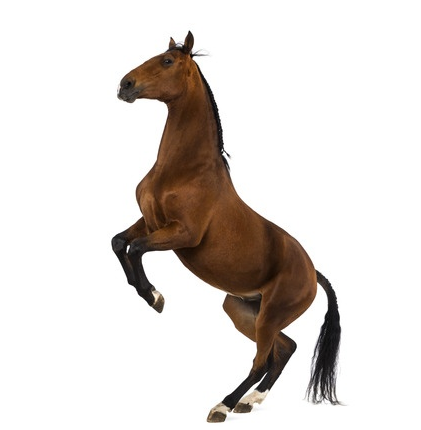 Horses will be more likely to attempt to move past an object after being able to observe it. This kind of investigation and desensitization is key to making your horse more confident and capable. At Deer Creek Structures, we offer high-quality wooden barns and sheds to clients across Texas and throughout the country. If you’re in need of a new barn or other outbuilding, check out our available barns online or call us at 254-546-2276 today to learn more.